Welcome to the first episode of the IN PLAIN SIGHT Podcast, a podcast to end human trafficking. I know that a podcast can never end such a human travesty, but you can…we can end human trafficking as we learn and work together. Over the last year and a half as I’ve been producing the IN PLAIN SIGHT resources, I’ve heard from countless leaders – both current and emerging – that there is a need for inspiring stories and actionable insights from people who are farther down the road on this journey. That’s why I’m launching this podcast as a source of inspiration and information for those of you who are taking action in your own city. Whether your focus is on prevention, demand, rescue, aftercare, or research, my hope is that each weekly interview with an experienced anti-trafficking leader will provide you with something you can use in your efforts. I’m less interested in “get to know you” interviews and more focused on a specific topic that will be helpful to a broad audience. 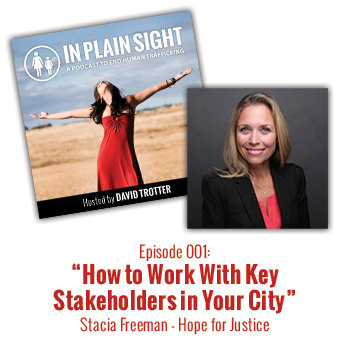 In today’s episode, Stacia Freeman, US Director of Hope for Justice, discusses how to connect with key stakeholders in your community as you seek to help end human trafficking. Why it’s important to connect with key stakeholders. What you need to figure out before reaching out to stakeholders. How to avoid common mistakes as you’re just getting started. I wanted to compose you that little remark in order to say thanks a lot the moment again regarding the superb pointers you’ve documented in this case. It is quite remarkably open-handed with people like you to offer extensively just what a lot of people would’ve distributed as an ebook to get some bucks for their own end, certainly since you could possibly have done it in case you wanted. These secrets as well served to be a good way to be certain that the rest have similar interest really like my own to realize very much more related to this issue. I’m certain there are millions of more fun moments in the future for those who looked over your website.